Minister of Industry and Commerce Rishad Bathiudeen congratulating a certified Chartered Accountant at the CASL 2017 Convocation joined by CASL President Lasantha Wickremasinghe at BMICH on September 12. With more economic reforms, the role of accountants too has become increasingly important, stressed Minister of Industry and Commerce Rishad Bathiudeen addressing the 2017 annual convocation of Chartered Accountants of Sri Lanka (CASL) recently at BMICH recently. “CASL has played a great role in producing Chartered Accountants for over 57 years. The role of well qualified accountants has become increasingly important to the economy. Sri Lankan Chartered Accountants earn high respect both at local and international levels and due to the high quality and integrity they show their reputation is widely known. This is the reason they are highly employable” said Minister Bathiudeen. “I am given to understand that a new Certified Accountants’ institution is to be established as a private MP bill and the Chartered Accountants of Sri Lanka are worried as they are not pleased of its accounting standards and it could overcrowd the profession here and bring down the standards. I believe any new accountancy body to be established should take care to not degrade the reputation and integrity of Lankan chartered accountants. I shall facilitate some discussions with the relevant Member together with you and to sort this out. CASL, under the purview of Ministry of Industry and Commerce is one of the largest accounting and financial professional bodies in the country with a growing ‘Student Member’ strength (over 44000 at present) and with another 5600 ‘Professional Member’ strength. 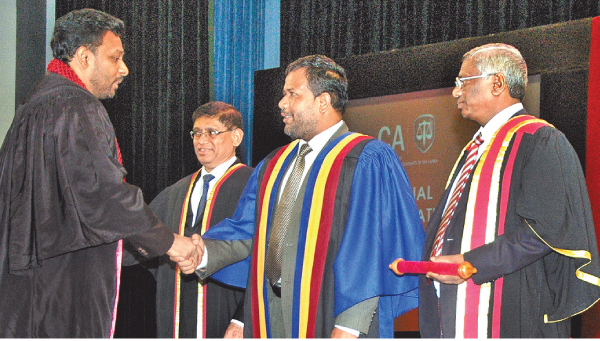 Joining Minister Bathiudeen at the convocation were CASL President Lasantha Wickremasinghe. At the event Minister Bathiudeen too awarded some certificates to new Associates & Fellow Members.